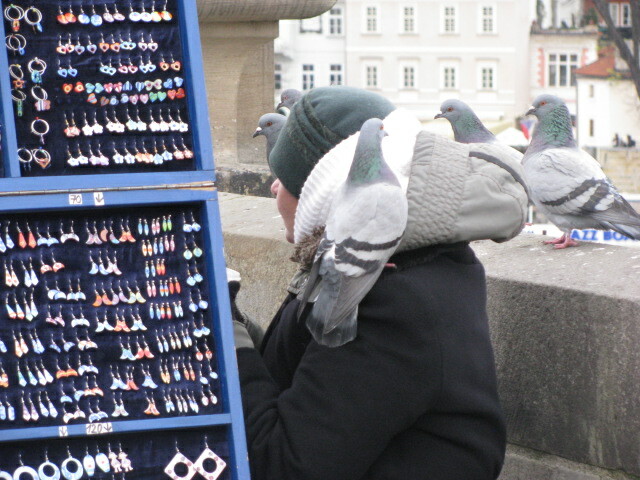 This woman sells jewelry on the Charles Bridge in Prague. The birds really like her. This entry was posted in Travel Photos and tagged Birds, Charles Bridge, Czech Republic, Life, Nature, Photography, Pigeons, Prague, Travel, Travel Blog, Travel Journal, Travel Photo. Bookmark the permalink. Excellent photo, I’ve want to go to Czech Republic sometime in the future. You’ll love it. So magical you may feel like you walked right into a movie. And I think she loves them. The pigeons make the pic! I was amazed when I saw it. I’m kind of glad the pigeons that visit my backyard aren’t quite this friendly. Your photo says a lot about her and the birds. I love pigeons, but not sure I want them on my shoulder. pigeons can be pests in our local parks. like squirrels and geese, pigeons are nice in the near distance, but i don’t want them getting too up close and personal. to each her own. Geese terrify me. I’ve had a couple run-ins with some geese gangs and I love them from afar, but quake in my boots when i have to walk by them. I’ve been trying to train my dog not to chase the pigeons. It’s a losing battle I’m afraid. Ok good, because I would love to know LOL!! Nice picture, TBM. The pigeons look really nice. I can see that 🙂 I wouldn’t like the laundry bill. I love birds and I find pigeons and doves fun but I agree about not wanting them on my shoulder. A great snap though TBM! Thanks. I think she spends a lot of time talking to the birds. And she seemed happy to do so. That is an amazing picture. Not sure I would want pigeons hanging all over me but it seems to work for her. to each their own. We have a pigeon lady in the neighborhood, but she just feeds them. Not once have I seen one on her shoulder like this. The pigeons seem right at home on her shoulder. Nice photo! Not sure about her, but I know I’ve been blessed a few times in my life. Didn’t know at the time that it was a blessing. However, others around me saw the humor. Oh, I love that bridge. She reminds me of the bird woman in Mary Poppins. Oh I can totally see that!